"Everyone we met worked hard and were very friendly." "4 rating is because of incorrect screw installation in..."
This homeowner in Bluffton, SC was experiencing drafts from the Attic. We installed our Eco-Guard PLUS over the existing insulation. This help make the home more energy efficient and more comfortably! 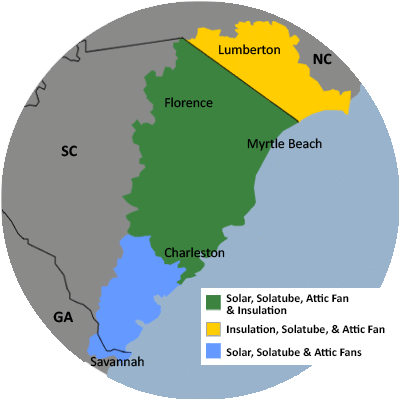 For a FREE no-obligation estimate in Okatie, SC, please fill out the form to the right and Carolina Energy Conservation will contact you shortly. We would like a solar tube in the kitchen to give us more light. We had windows above the cabinets but closed them so we could install taller cabinets and now find the kitchen to be too dark. AC unit is very new but house not cooling as well as would like. Many skylights and at least two have no insulation. Condensation on ac registers drip on floor. I would like a price for adding Blown in Insulation over existing insulation. Heat buildup in attic causing very hot temps and very hot garage. Just put in insulation which helped a little but think we need to exhaust the heat to get maximum benefit in whole house as well. I would like solar sky tubes put into my kitchen area and your company was recommended to me. Great company with informative employees. Very quick follow up. Installation went very well. So pleased with the results. We specialize in a variety of services aimed to lessen your home's carbon footprint and save energy and money each month! We offer it all, from air sealing to ductwork to insulation and HVAC services in Okatie, SC. For a FREE, no-obligation services estimate in Okatie, SC, you'll also receive a free copy of "Saving Energy and Money at Home," a great book to use as you begin to create a more comfortable, healthy, and energy efficient home! Interested in installation of solatube. We have a room in our fairly new home, built in 2013, that is always hot int he summer and cold int he winter. Would like to know if you have a product or service that might resolve that issue. Would appreciate a contact and perhaps an in home evaluation of the issue. I live in Sun City Hilton Head.